American comedian and actor Red Buttons has died at the age of 87. He died of vascular disease at his home in the Century City area of Los Angeles, according to his publicist. Famed for his red hair, his career began in the 1930s on stage before he landed his own television programme, The Red Buttons Show, in 1952. 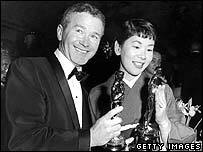 A move into cinema brought him a 1957 Oscar win for best supporting actor as Sgt Joe Kelly in the film Sayonara, starring Marlon Brando. His last screen appearance was in a recurring guest role in hospital drama ER in 2005, for which he was nominated for an Emmy. His publicist Warren Cowan said he had been ill for some time, and was with family members when he died. In his teens, Red Buttons was spotted by burlesque theatre owners, becoming the youngest comic on the circuit. His success in Sayonara led to other film roles including The Longest Day, They Shoot Horses, Don't They? and The Poseidon Adventure. Red Buttons' career spanned 60 years and took in all forms of performance from comedy and theatre to television and cinema. He was born Aaron Chwatt on 15 February, 1919, the son of an immigrant milliner, in Manhattan, New York. The name Red Buttons came from his hair colour and the nickname "buttons" given to hotel porters - a job he did in his teens. At the age of 16, he worked as a singer on the Borscht Circuit, a string of resorts in New York state catering to a mainly Jewish clientele. Other stars who also once performed on the circuit in the early days of their paths to fame include Danny Kaye and Mel Brooks. 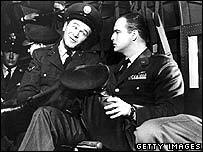 Stints on Broadway followed before Red Buttons was drafted into the US army in 1943. A return to showbusiness in 1946 eventually led to a career in television. When he landed his The Red Buttons Show, it ran for three seasons from 1952, making him a household name. In later years, he appeared in TV shows such as The Love Boat and Knots Landing. He was married three times and had two children.